What we have here is a large dark bird with long wings and a fairly long tail. The wings are too rounded for any gull, tern, or jaeger. Herons, cranes, and ibises have shorter tails and longer legs. Cormorants have shorter wings and are darker below, and pelicans have contrastingly patterned wings. Frigatebirds have forked tails and pointed wings. The uniformly dark and unpatterned wings are wrong for an owl. Could it be a diurnal raptor? Why yes, it could, but since we can't see the head this identification won't be easy (and if we could see the head the identification would be too easy). As mentioned before, the wings of our quiz bird are rounded, so falcons and kites can be eliminated right away. Accipiters have shorter, straighter wings and longer tails with wide dark and light banding. Northern Harriers of all ages have a prominent white patch on the rump. The crooked wing shape suggests a Turkey Vulture but TVs (Black Vultures too) have completely dark underparts, and we can see that the underparts of our candidate are whitish and unmarked. Eagles have dark or mottled underparts. Several buteos have the crooked wing shape of our quiz bird, including Rough-legged Hawk, Ferruginous Hawk, and Swainson's Hawk. Rough-legged Hawk is the easiest to eliminate since it has completely dark underparts, a dark belly band, or at least some dark barring near the legs. As noted before, our quiz bird has unmarked whitish underparts. Ferruginous Hawks have a pale primary panel at all ages. The wings don't look pointed enough for a Swainson's Hawk and Swainson's have tails with fine dark banding. Also, many Swainson's Hawks show pale spotting on the uppertail coverts, which our bird lacks. 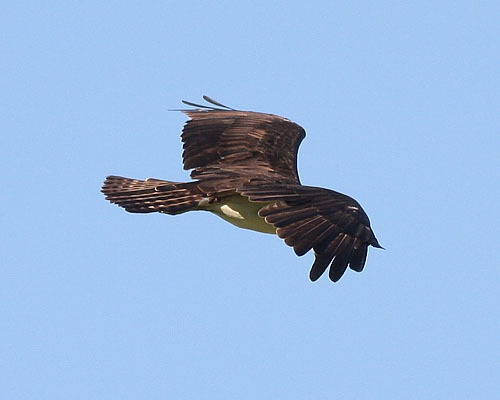 The wing shape of our quiz bird, with the inner part of the wing (the arm) angled up and the outer part (the hand) angled slightly down is typical of an Osprey. This Osprey was photographed in northern Illinois by Vic Berardi.